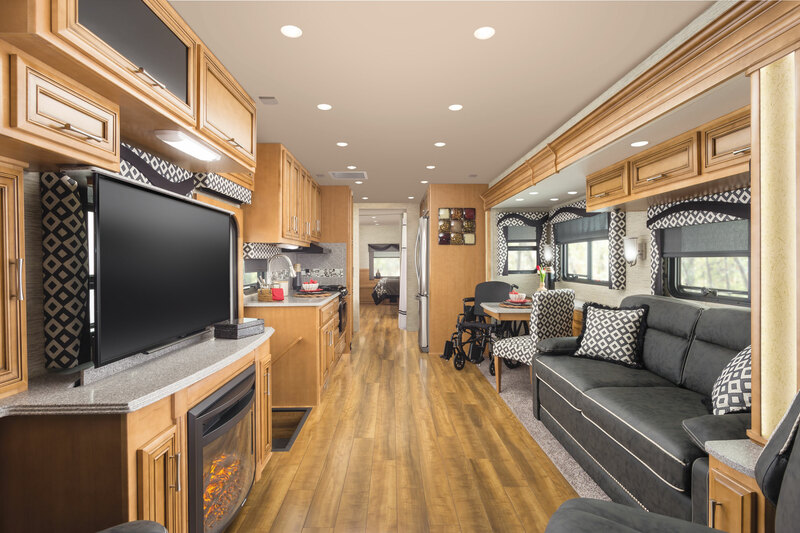 The Newmar Canyon Star is an outstanding innovation in RVing that is stacked full of some of the most versatile and useful features that you can imagine. 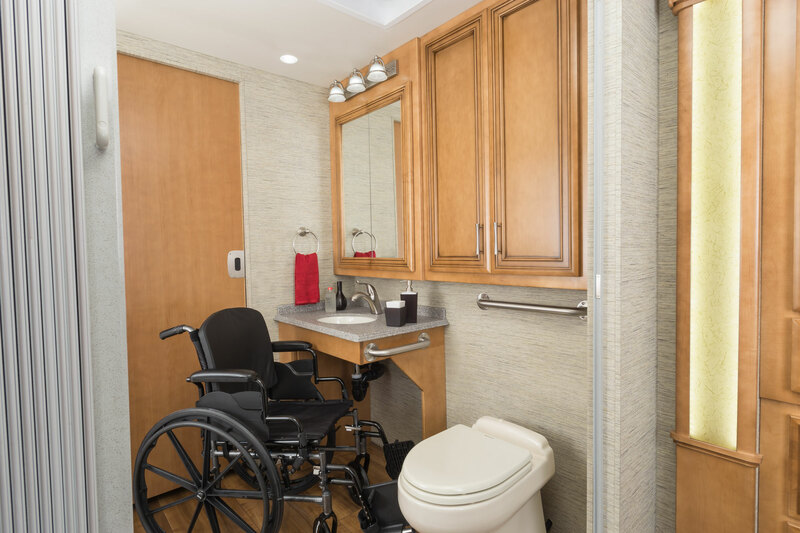 The 3911 floorplan of the Canyon Star is wheelcair accessible and just one of the many examples of models that will absolutely change the way you go on roadtrips. From top to bottom, the Canyon Star 3911 is an awesome class A motorhome with some features as simple as a fully stocked kitchen with stove, sink, fridge, double pantries; and more advanced and rare feature like a full washer and dryer, wheelchair lift for handicap accessibility, and overstuffed jackknife sofa. 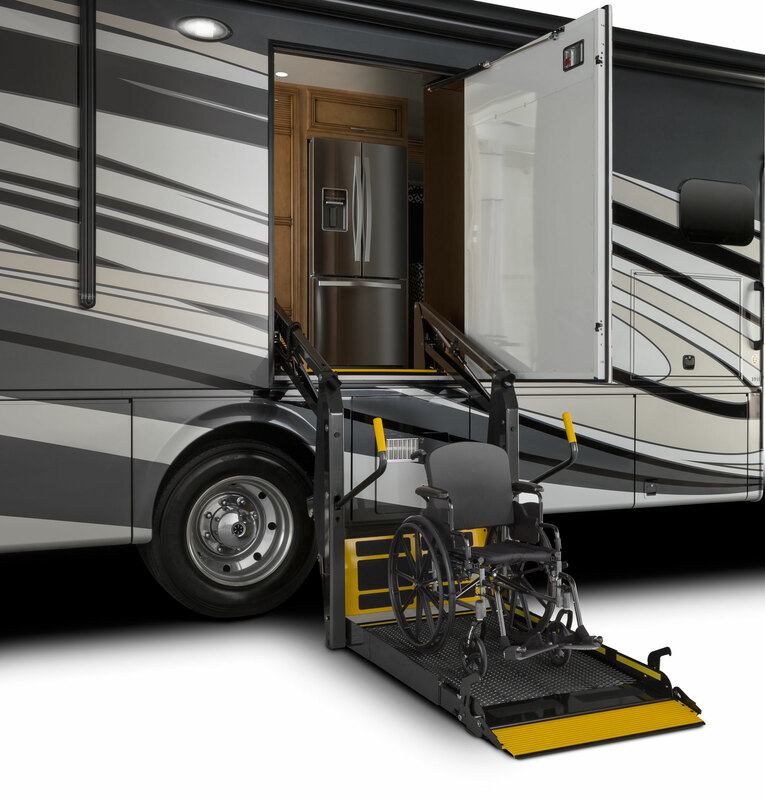 The Canyon Star 3911 utilizes a power wheelchair lift that features dual handrails and a lifting capacity of 800lbs. In the rear of the Canyon Star, the bedroom is outfit with a large, queen-sized bed and bedside ward, full closet, overhang, and built-in television. The bedroom has rear windows and a lot of floor space; so much in fact that you will be able to move around with ease and not be cramped at all. All of this with a chest of drawers so that you can bring all of your clothes regardless of how long you plan on your trip being. Check out the low prices we have on the Newmar Canyon Star. The bathroom of the Canyon Star has a 48”X36” roll-in shower that is incredibly spacious in comparison to some other class A restrooms. Not to mention the awesome living area that comes complete with a large dinette area with plenty of seating for the family. So, if you are going on a long trip and you plan on bringing the kids, they have room to play games and entertain themselves, making even the longest trips very enjoyable. Plus, the driving seat and side chair rotate entirely, making more seating in the living room a cinch. Above the driving area, there is an awesome, large television on the overhang, so the entire RV can see the television wherever they are. If you are interested in learning any more about the fantastic Canyon Star 3911 floorplan, you can contact us today for more information. Or, just come on by Wilkins RV and see the Canyon Star or any of our other Newmar products first hand.